Forever Young: Selections from the Joe Baio Collection of Photography steals the show at the 2018 iteration of the AIPAD photography show, the renowned annual photography event in New York City housed at Pier 94 in Manhattan and on view April 5-8. Photographic objects from the collection are suspended, salon-style, with a specific view toward the poignant moments of adolescence and childhood memories. Among these works, on view from the collection for the first time ever, an artwork by artist Arlene Rush emerges from the cusp of the center and left-facing walls, shimmering as visitors approach. 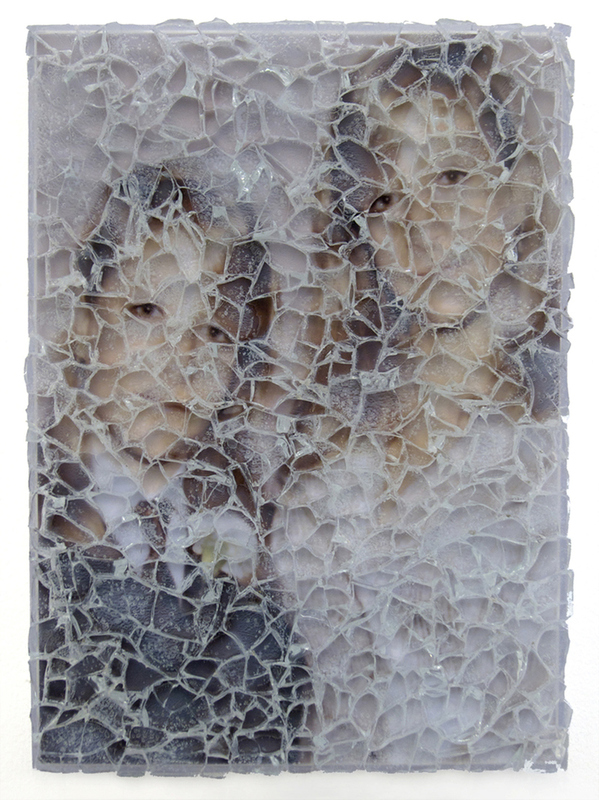 This effect, caused by shattered tempered glass carefully arranged over the surface of the photograph, beckons guests closer to examine a seemingly straightforward portrait of two young women holding hands. These teenage girls, blond and smiling, seem charming yet unsettling… until the viewer realizes they are, in fact, identical twins. 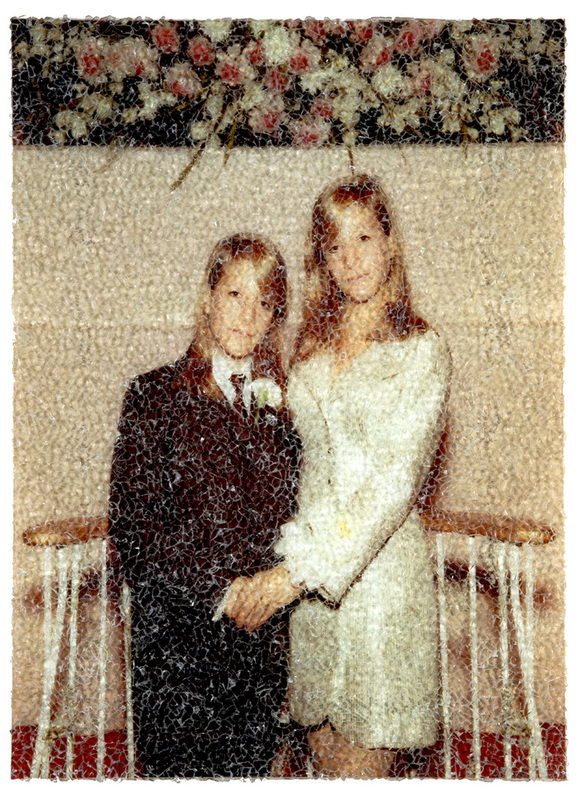 Rush was born as a twin to her brother, whose bar mitzvah photo this image was derived from. The two figures stand intrinsically linked in this work, Twins: Just a Memory: the scattered glass creating a mirage of imagined histories. This piece is the first from an identically titled series of work the artist produced reflecting on adolescence and sexual identity. 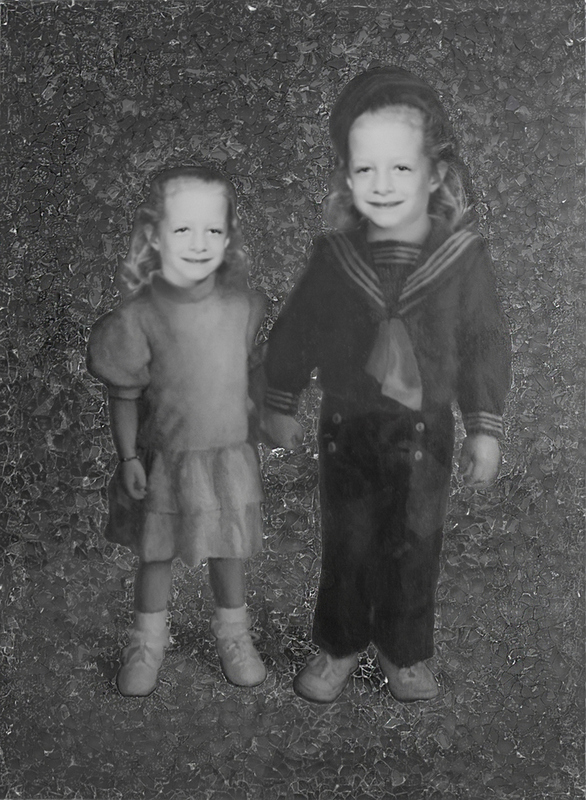 Rush’s Twins: Just a Memory series revisits childhood moments in which the artist mines her personal history and growth as a woman and artist to comment on gender roles and societal norms. The artist has taken the image of her and her brother at his bar mitzvah, re-imagining instead what it would be like for her to experience adulthood from the viewpoint of both male and female. She reflects on the use of the family portrait as entry point into this conceptual rigor. “Kitschy and poignant, [the work] speaks about gender equality and expectations [which] religions and society [place] on us growing up.” These expectations find space to dissolve in these atmospheric works, in which identity is present upon close encounter yet obscured from far away. Rush finds solace in examining the elements of surprise and nuance offered by the veil of shattered glass applied atop the portrait. The forms are identifiable, the dress code clear, yet the results manage to be both surprising and surreal. Questioning the relevance of coded gender norms today versus the artist’s experience growing up in New York City, Rush has worked as a conceptual artist questioning identity in multiple disciplines. The artist has worked across photography, installation work and sculpture, including welding with steel – a discipline prominently anchored by male artists in the 1970s and 80s when the artist was beginning to work. Starting to blossom in her practice in an era not far removed from the echoes of the male artist-dominated Cedar Tavern, perhaps the artist’s poignant re-examinations of gender expectations – both in her own life and in society as a whole – stand as a testament to the hopes we hold for women to assume prominent positions both in the arts and in the brave new world ahead. AIPAD is on view from April 5-8 in midtown west, Manhattan, at Pier 94. More information on admission can be found on the show’s website.